U.S. Sen. Jim Inhofe says he fully expects to be chairman again of the U.S. Senate Environment and Public Works Committee, according to a story in The New York Times, and it’s one of those GOP bravado that symbolizes this election year. In order for Inhofe to become EPW chairman, Republicans will have to gain control of the Senate this election year, and polls increasingly show that to be at least a slight possibility. Meanwhile, here in Oklahoma, polls have shown that our Democratic gubernatorial candidate Lt. Gov. Jari Askins trails her Republican opponent U.S. Rep. Mary Fallin by 16 percentage points. Inhofe as EPW chair again? Fallin as governor with Republican majorities in the Oklahoma House and Senate? 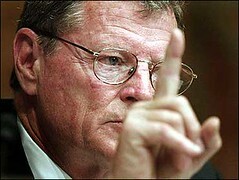 How will those two potential facts, if they come true, affect Oklahoma, the nation, and, in Inhofe’s case, the world? It’s difficult not to see it as extremely problematic for Oklahoma’s future. Inhofe will continue to sully the state’s image with bizarre claims denying global warming, and Fallin, with help from GOP legislators, will undoubtedly try to put state government even more under the framework of corporate ideology. His top priority, [Inhofe] says, is to stop “wasting time” on global warming hearings and get down to business on issues he says have been neglected, like overseeing U.S. EPA and passing major transportation and water infrastructure bills. “We haven’t really been doing anything because they’ve been wasting all of our time on all that silly stuff, all the hearings on global warming and all that,” Inhofe said. Expect more of the “silly stuff” talk from Inhofe if he does regain the committee leadership. Also, expect any progress that has been made on climate change or green initiatives to be publicly denigrated and rescinded. Inhofe, of course, has been campaigning for Fallin. We can assume they share basic, right-wing political beliefs. In the face of bad poll numbers, the state Democratic leadership is trying to pump up people before the midterm elections, reminding us of the uncertainty surrounding polling in the contemporary world. On another note, The Tulsa World published an article releasing polling from the infamous SoonerPoll. This poll of course has everyone down (some significantly). SoonerPoll, if you remember, showed Jari Askins down by 16 points from Drew Edmondson in the days before the primary. We know how that election turned out. This particular poll has Jari down from Mary Fallin by 16 points… sound familiar? We just want to emphasize that while this is a tough election year for Democrats, don’t believe the hype of the polls. Their goal is to make us feel despondent and hopeless so we don’t vote and don’t spread the word. This election is too important to fall for those old games. We must continue the hard work, continue to tell our friends, reach voters and doing everything possible to get everyone out to the polls on Nov. 2 and vote for the most qualified candidates in the race: . . . This pep talk has validity, and it’s much needed right now. Despondency just drains energy. The truth is the U.S. Senate is in play and some political observers believe Democrats can retain control. Askins does have an opportunity to beat Fallin with a strong finish. She’s beat the odds before.